1 gram BP main decoupling charge in a 1/2" x 19" pvc pipe. This charge holds two Davey Fire e-matches (2001 A/N 28b), one from the main flight computer and one from the back-up flight computer. Capsule - Gwiz MC used as a back-up to the primary flight computer for the decoupling charge but will also deploy the Capsule's parachute using its low altitude deployment channel. Tower - Perfect Flite Timer with a 2 second delay is used to deploy the tower parachute. 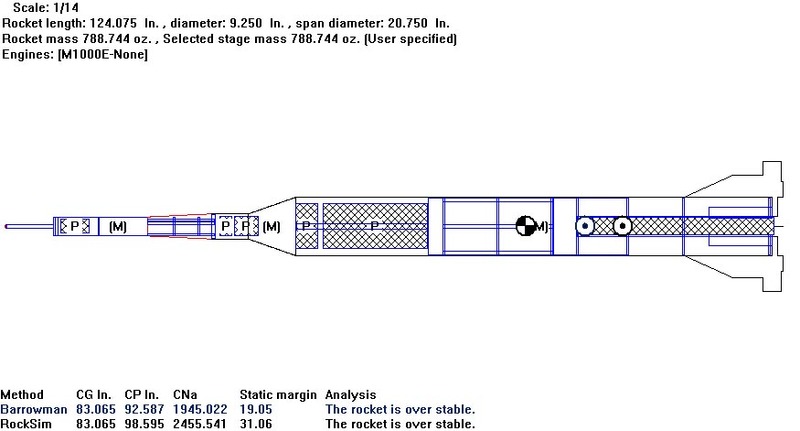 Note: The delay allows the capsule time to pull away from the booster. 2.4 GHz transmitter and camera in the escape tower looking down supplying a live downlink feed of the flight to the ground crew. Aiptek DV4500 will record the classic view looking down from the booster.